Be a part of the event to raise funds and awareness for community needs. 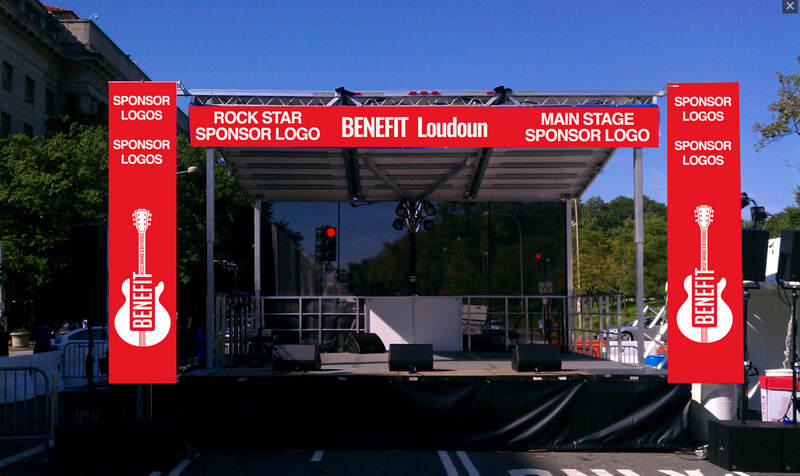 BENEFIT Loudoun is an all-day music festival featuring a slate of popular, local bands. It is the flagship event of BENEFIT, a coalition of musicians and community leaders committed to raising awareness and funds to support the work of local non-profits organizations. All proceeds from the event will be placed in a component fund of the Community Foundation of Loudoun and Northern Fauquier Counties and distributed by a grant application process to qualified non-profits serving the needs of Loudoun County residents. Held at the Village at Leesburg on September 22, 2018, from 3-9pm, general admission will be free to the public and thousands are expected to attend. Food/beverage and merchandise sales will be the primary fundraising drivers that day, so support from our valued sponsors is critical to raising significant money and sustaining our event from year to year. BENEFIT Loudoun will offer significant exposure to sponsors through an intensive promotional strategy that includes traditional, digital and social media, in addition to opportunities to make brand impact on the event attendees. Please see the attached schedule for a specific listing of benefits associated with each sponsorship and the associated investment. Associate your brand with the largest benefit music festival in the region that promotes over 30 charity organizations. Guests will be reminded at every opportunity that BENEFIT Loudoun has been brought to them by your generous support. Your guests will have full access to the VIP Experience and special event tee shirts to commemorate the day. The main stage will be the focal point of the festival, and our Title/Main Stage sponsor’s brand will be front and center all day. Guests will be reminded at every opportunity that BENEFIT Loudoun has been brought to them by your generous support. In addition to prominent, high quality signage, our Title/Main Stage sponsor will enjoy live reads by our celebrity emcee, Cerphe Colwell, logo placement on our event t-shirts, and a generous supply of VIP tickets entitling access to our luxurious, catered tent. The VIP Experience is like a backstage pass to BENEFIT Loudoun. Fully catered, adult beverages and soft drinks, the exclusive experience will enable our VIPs to enjoy the live music in a special seated area. Meant to provide a high-end experience for sponsors, clients and individual donors, the VIP Experience, hosted by community leaders, is a great opportunity to entertain, network and associate your brand with luxury and fun. Prominent signage, pre-event promotion, and day-of entertainment opportunities are all included. Through a partnership with the amazing Half King Studios, BENEFIT Loudoun will feature acoustic performances from emerging artists in between the main stage acts. These artists are supremely talented, and BENEFIT Loudoun provides a valuable public performance venue for them. In previous years, these emerging artists have wowed the crowd. You’ll be proud to attach your support and your company’s brand to these artists. A sunny, September day full of high-energy music demands an adult beverage, available in our Beer Garden. This outdoor area will be the place to grab your favorite beverage and a key fundraising center of the event plus prominent signage and pre-event advertising. Our crew are the heartbeat of the main stage area, ensuring a quick transition between bands and helping the musicians move their gear to and from the main stage. They ensure our sound engineering is top-notch and maintain the green room area for performers to prepare for their shows. You’ll know them by their special black BENEFIT t-shirts, and as our Stage Crew Sponsor your logo will be exclusively featured on their backs. Additional promotional value before and during the event is included. Our core mission is to raise awareness and funds to support the work of non-profit organizations in our community. Non-profits are invited to exhibit during BENEFIT Loudoun under a tent in our Non-Profit Village. This opportunity provides valuable exposure and gives non-profits a chance to share their own missions, recruit volunteers and accept donations. Sponsorship of the Non-Profit Village will give your company the chance to demonstrate your commitment to the Loudoun community. BENEFIT Loudoun is family-friendly! This year’s youth activity is a hip temporary tattoo station where young people, and of course the young at heart, can get the BENEFIT logo tattooed on their skin in a jiffy. Located under a tent, prominent signage will tell the festival this cool, free activity is available thanks to your generous support.